Shireburn Indigo Payroll is an award-winning, web-based payroll, leave and attendance management solution built entirely with HR and payroll administrators in mind. It is designed to simplify your work, automate as many processes as possible, and provide you with a platform to better manage your entire workflow, accessible from virtually anywhere. Using our years of payroll software experience in the local market, we built a system that you’ll find simple to use and practical, whilst comprehensive in its capacity. Whether you manage the payroll for a small or large number of employees, Shireburn Indigo helps eliminate much of the administration that comes with payroll. It features an Employee Portal that allows employees to manage their leave, view their payslips, past FS3s and more, leaving you to concentrate on more important matters. In addition, you can set your mind at rest that you’ve got a system that’s in complete compliance with Malta Government and Inland Revenue regulations. Talk to our team today and see how you can benefit. With a number of automated set up and migration options, Shireburn Indigo Payroll is quick and easy to get going, both for small and large organisations. The system is designed to get you started in no time at all. Get in touch with us to find out how. After we saw a demonstration of Shireburn Indigo Payroll running on the cloud, we immediately agreed to implement the solution, especially when we recognised the benefits of the employee portal. It addressed all our needs with no installation procedures. This was also complemented with the efficient support provided by Shireburn’s team. CreditInfo Malta is a respected provider of Credit Risk Management Services in Malta. We had been using the on premises Shireburn Payroll System (SPS) since 2010. When Shireburn released their cloud version, Shireburn Indigo Payroll, we were interested to upgrade to their new system. Apart from running the payroll for 94 employees, we now have an employee portal that all staff can access to manage and apply for leave as well as view a number of documents such as payslips and FS3s. User feedback has been very positive. With Shireburn’s support, we look forward for further enhancements to this product. Credorax Bank Ltd is a hi-tech and financial institution focused on acquiring in the e-commerce arena. I have worked with Shireburn for so many years across most of their products and I was always satisfied with the functionality provided by their solutions and most importantly their support. With their latest cloud offering, Shireburn Indigo, they continue to maintain their service levels and expand their product range by making use of the latest technologies to meet client needs. We were originally referred to Shireburn a couple of years ago for an accounting system which we took on, and have since been very satisfied using it. We recently decided to bring our payroll in-house, and based on our satisfaction levels with Shireburn, we approached them with regards to their cloud based Shireburn Indigo Payroll. It catered for all our requirements, looks good and is easy to use. It also includes an employee portal with easy access to request vacation, download payslips and other documents. We are pleased that Shireburn are offering more cloud based products and look forward for more modules in the near future. Bluefort delivers comprehensive business solutions based on Microsoft Dynamics technologies. We’re using Shireburn Indigo for our Payroll and Leave Management Processes, moving on from Shireburn’s on-site SPS solution. 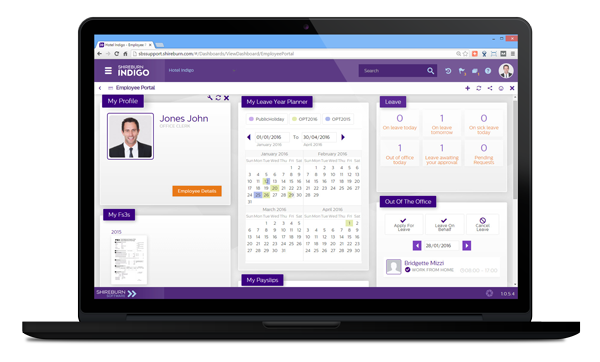 Using Indigo brought so much flexibility in the way we work, with all team members feeling part of the process via the user interface; and with the solution being cloud-based, it allows the HR team to manage this process from any location. Furthermore, the support provided by Shireburn in terms of setting-up profiles and organisation charts within the system was second-to-none. The Concept Stadium is composed of a bunch of commercial creatives – a team of urbanites who put their creative skills and ideas in practice to generate innovative, digital and commercially-driven market activations focusing on value-added UX. The Concept Stadium takes a boutique marketing approach with all clients, understanding the importance of being a market leader, both in terms of profit and aesthetic. We’ve found Shireburn Indigo Payroll to be very intuitive and user-friendly, plus running payroll in a matter of minutes is a great advantage. The interface is well-designed and having staff accessing their payslips and applying for leave through the system saves us a lot of time. Switch is a local Brand and Design Agency. Although we had a set of complex and highly specific requirements for a stock inventory and financial solution, the Shireburn team helped us find what we needed, implemented the system, and got us up and running in no time. We are now also running our payroll using their cloud based Shireburn Indigo Payroll. Adore More are a leading supplier of products made from quality craftsmanship, such as doors and windows. We wanted to implement a payroll solution that was easy to use, and accessible online from anywhere, whilst addressing some of our specific requirements. Once we saw a live demonstration of Shireburn Indigo Payroll we all agreed to go ahead. We also find they have excellent customer support to compliment the product and this provides us with that extra level of comfort in our use of the system. As a payroll service provider, we were looking for a payroll solution that runs on the cloud, making it easier for us to service our clients and run their respective payrolls. Shireburn Indigo’s competitive pricing and practicality make it an attractive product for us to use in order to service our clients with their payroll requirements. Needless to say it also satisfies all statutory requirements. Since implementation, we’re pleased to have added on more clients to the system which is also scaling well for our needs. Management Consultancy Ltd specialises in consultancy, independent advice and assistance about management issues to small and medium sized enterprises in Malta. As a satisfied user of Shireburn’s Payroll and HR System (SPS), I was more than happy working with what we had. But when Shireburn launched their cloud based Shireburn Indigo Payroll, the benefits of having an employee portal with leave functionality available to all staff online, pushed us towards this web based system. We’re very pleased with our decision to switch onto the new solution, as well as with Shireburn’s team backing it up. MJM Europe Ltd offer a number of corporate, relocation and financial services to businesses setting up in Malta. When Shireburn launched their Cloud based Indigo Payroll we were more than happy to move away from their on premise Shireburn Payroll System (SPS) and onto the new technology. Shireburn Indigo Payroll provides an Employee Portal that not only gives our staff the flexibility to securely apply for leave online, but they can also view their leave balances, download their past payslips and FS3s amongst other functions. The leave authorisation hierarchy, through a drag and drop organisational chart, is so much easier to maintain in our fast-changing and dynamic environment. On top of that, Indigo interfaces directly with BambooHR – a world leading HR management tool – and this has saved us a lot of work related to integrating our payroll and HR related data. Based on our experience, we highly recommend using Shireburn Indigo Payroll. Catena Media is one of the world’s most successful online lead generation companies in the iGaming industry. Dizz Group have been long standing users of Shireburn Software since 2009, both for accounting as well as payroll software. Over the past 6 months, we embarked on a project with Shireburn to migrate our 20 retail outlets to the POS system. Now, we also switched from the on-premise Shireburn Payroll System (SPS) to their newer Shireburn Indigo Payroll which is cloud-based. We worked smoothly with the Shireburn team and got this going. Even after just a couple of months using Shireburn Indigo Payroll, we can already see the benefits. Being web-based, we can access the system and work from anywhere. In particular, the Employee Details screens and the step by step Payroll Calculation Process are extremely user-friendly and fantastic to work with. The reporting functionality is also an improvement from SPS, with special regard to the payroll report that is so much easier to filter and issue. We’re very satisfied with our decision to migrate. Dizz Ltd is the franchisee of prestigious fashion brands Terranova, Calliope, Liu Jo, Make Up Store, 7camicie, Brooks Brothers, Guess, and Max&Co amongst others. This year we took the decision to switch from the Shireburn Payroll System (SPS) to Shireburn Indigo Payroll. Amongst the many aspects that drew us towards the new platform, the critical features that have been time and cost saving functions to us have been the much better filtering techniques, enabling us to sort through employee profiles faster, the more flexible reports exportable to Excel, and undoubtedly the employee portal allowing employees to view their own leave balances instead of resorting to the HR team for frequent updates. Very pleased with the system and we look forward to continuing to work with the excellent Shireburn support team. Motors Inc Ltd is a joint venture between three leading business groups in Malta, Tum Invest, Pater Group and United Group and is the official concessionaire of Alfa Romeo, Fiat, Fiat Professional, Iveco, Jeep, Hyundai, Kia and Opel brands. We had been using Shireburn’s Payroll System (SPS) for two years and were always pleased with Shireburn’s system and support service. Once they launched the cloud version Shireburn Indigo Payroll we immediately took the decision to upgrade to the newer system as it came with an employee portal. The employee portal offered a leave management solution whereby all our staff would login to apply for leave, view their leave balances and view whom of their colleagues are out on leave. Compliance was further simplified as employees were able to download their payslips and FS3’s. Having this portal in place has relieved the HR department of a lot of administration work. Combined with a smooth transition from SPS to Indigo, I am pleased to announce that we are delighted with our decision to switch. Nexus Gaming Intelligence offers white label solutions, consultancy, resource management, accounting and regulatory services for the gaming industry. Group Financial Controller, NRR Entertainment Limited.